« Greek Salad–a week of test drives! It’s a sequence I’ve been dining out on ever since I saw the film in the Sixties. 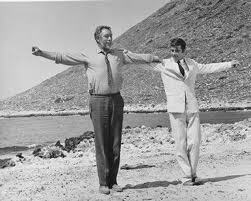 Anthony Quinn and Alan Bates start to dance in the final scene of Zorba the Greek. Roll forward to Sunday morning in “our” nearby village and a group of youngsters ( late teens for the most part) are gathering for a final dance rehearsal. They’re leaving at five this evening for an international dance festival in San Sebastian on the north east Atlantic coast of Spain. Along one wall of the rehearsal hall–below the many colorful photos of dances and costumes– the neat pile of suitcases is growing. The level of chatter from the excited young dancers is getting louder–many of the group are probably leaving Greece for the first time. Meredith sat opposite Maria–the mother of one of the dancers and also a member of the troupe–two nights ago, at a seaside taverna dinner given by our hostess, Peggotty, for Corfiot friends, made over the many years she and Andrew have been coming to Corfu for holidays. When Meredith asked Maria where she could see some authentic Greek folk dances, Maria had a whispered exchange with nearby friends at the table then turned back to Meredith and said that if she liked, she could come to the final rehearsal on Sunday at the hall in Sinies. The answer to her prayers! By ten it’s already hot as locals and holiday makers come by to collect their day’s bread supply from the village store opposite the rehearsal hall. Word has got round our group and it has grown like Topsy–the final rehearsal is turning into a non-dress performance–not a bad thing perhaps for the young dancers to experience a real audience. under the encouraging eye of Ioannis Vlahos, one of the best dance teachers in Corfu– we are told. For the next hour they run through their repertoire. The assurance and ease of movement, the lightness of touch and the commitment to a tradition is delightful to watch. Then after a pause to catch their breath and drink some water they regroup for the final dance–ZORBA! As we approached Corfu Town on our way to the airport just before six that evening, a big tourist coach passed us at speed on the dual carriageway. In the back window a large sign announced it was carrying members of THE CULTURAL ASSOCIATION OF SINIES! They were on their way! Just charming,. I was smiling the whole time.These kids are good. Thank you for the link. Kalinichta Robin,Ha nice, I used to know also ” a best dancer” called Harris .Sirtaki a volenté Enjoy and Yamas !!! What a joy to see youngsters promoting their cultural heritage. Reminds me of when we took the family to a song/dance festival in Crete. It was a typically laid-back affair, beginning about an hour late; but once the performers got going it was amazing. Did you have a go? I creakily, tentatively, moved left and right in time to music but then decided that spectator was the wiser choice! They were wonderful and I hope they are having a good time at the other end of the Mediterranean. on June 27, 2012 at 12:52 pm | Reply Caroline P.
I understand why you stopped and be a spectator at the end I know it is going faster and faster. Like Meredith I enjoy dancing very much. Last weekend I did three performaces with my Modern Dance group. I was very nervous but it was very nice to do, in front of our family and friends! and it is just as healthy as doing sport so…. I like this post very much! This was a great story! As an orchestra director of high school musicians who has taken students on many bus trips, I know that there is much hope for the future with our young artists. When they work on a goal to succeed, they unfailingly rise to the occasion. Hope you had a great time in Greece! These youngsters were impressively committed and they could dance! Dear Robin, Here in Belgium after a few days of heavy sunshine, rain, rain.When do you come back to France, I bet the cats missing you (and the other animals) Have a nice time overthere in the sun HOPA !! (with the dance) Hughs, Chantal. Heard a rendition of Zorba on the radio earlier and wondered if you ever discovered how the young dancers had got on in San Sebastian? Pleased to hear your operation was a success; and look forward to seeing the result of your chapeau shopping! It was a festival not a competition. They nearly came by on their way home but I guess it was a step too far. They were charming and talented. How was your time at San Sebastian? 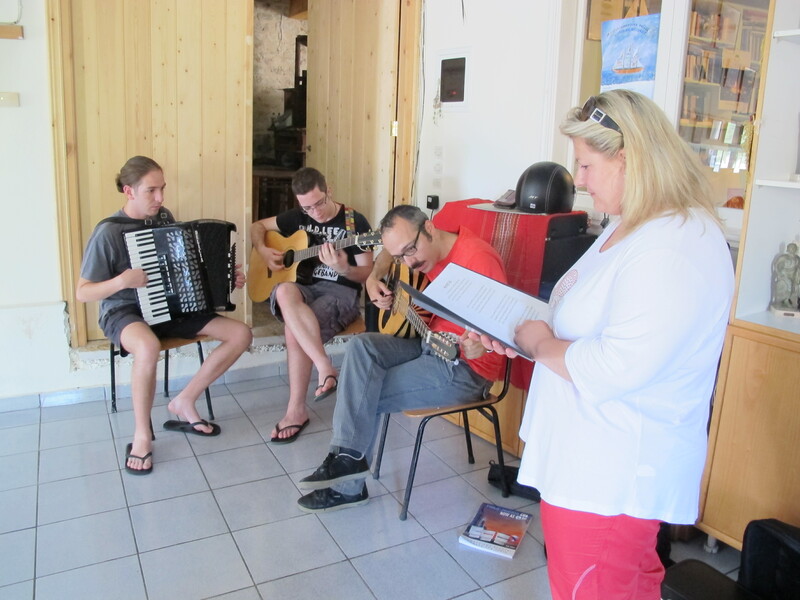 You are such a talented group–I hope we will meet again in Sinies. It was wonderful for us to watch your final rehearsal that Sunday morning–thank you and everyone again!